This article appears in print in the February 2019 issue. Click here for a free subscription. 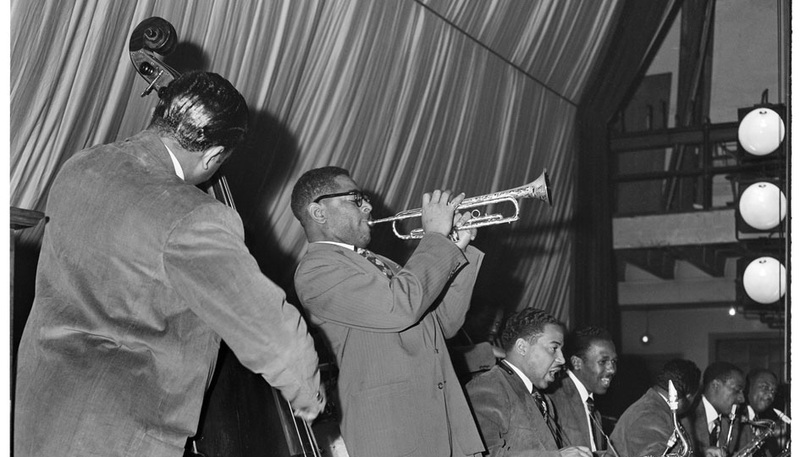 On February 19, 1949, 31-year-old trumpeter Dizzy Gillespie performed with his orchestra in the Senator Ballroom of the Eagles Auditorium Building at Seventh Avenue and Union Street — now the home of ACT Theatre. With alto saxophonist Charlie Parker, Gillespie was considered a founder of bebop, a style of jazz music featuring fast tempo, complex chord progressions and instrumental virtuosity, which evolved from swing-era music in the early and mid-1940s. Longtime Seattle photographer Al Smith captured the moment that night, as he did thousands of other events during six decades as de facto chronicler of the African-American experience in Seattle. Smith, who operated a business called Al Smith: On the Spot, would photograph entertainers and patrons at the jazz clubs and concert venues in Seattle and then sell prints for 50 cents each a few days later.